I'm sorry I didn't post this on the first, like I should have done! This months challenge - chose a book off your shelves that was published between 2007 and 2010. 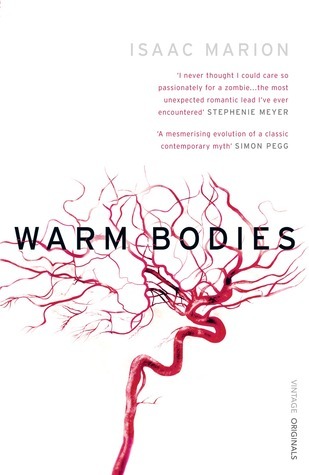 I've chosen Warm Bodies by Isaac Marion which was published in 2010! Goodreads Summary: 'R' is a zombie. He has no name, no memories and no pulse, but he has dreams. He is a little different from his fellow Dead. I'm making a real effort to read more books this year. So, while I'm currently reading Eleanor & Park for the ADF Book Club, I think I'll finish it before the end of April and have time to read another...hopefully. So, in order to participate here, too, as soon as I finish Eleanor & Park, I'm going to start The Kitchen House by Kathleen Grissom (published Feb 2010). I read Warm Bodies, but I didn't see the movie. The movie previews made it seem a bit more comedic than the book. I enjoyed the book, and will probably see the movie when it's out On Demand. I was going to go see the movie, but I just never got around to it. They've obviously changed things from the book though, but I'm still interested in seeing it :).